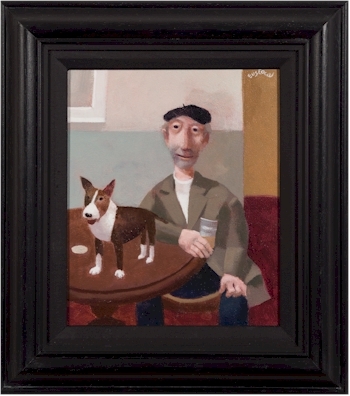 The artist David Eustace, born in Birmingham in 1950, is now based in Exeter. 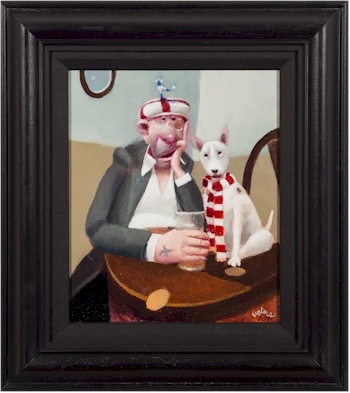 Born in Birmingham in 1950, the artist David Eustace now lives in Exeter. Eustace has a small modern studio, which he visits most days, in a complex of other studios and workshops for local craftsmen and designers. Eustace works in a tradition of English imaginative painters like Stanley Spencer, Alfred Wallace and Beryl Cook and among his other influences he cites Rene Magritte and Douanier Rousseau, Atkinson Grimshaw William Blake and David Hockney. Eustace is an artist who observes closely and then looks inwards to engage with his own interpretation of what he sees, imagines and thinks. There are two strong themes to his work. The anecdotal and narrative paintings which embrace the street and the townscape as a theatre to observe and from which to draw inspiration and ideas. And the more eccentric and reflective dips into the sub-conscious with a Freudian-type interpretation of dreams, memories and emotions. These themes are represented in a group of over 30 paintings being offered in the Picture Sale on Tuesday, 11th April 2017. 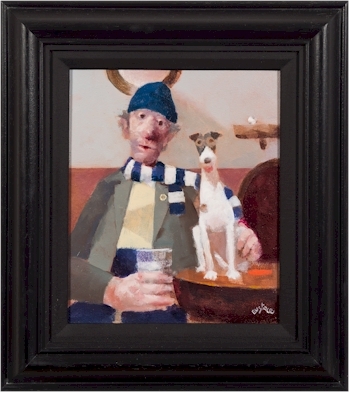 The group includes humorous character studies of men with pints and pet dogs in pub interiors alone. There are narrative scenes of St Ives and Exeter and imaginative depictions of states of euphoric and self-reflective fantasy. There are also coastal views from the imagination with the sea as a metaphor for yearning for something unobtainable, of people and figures out of reach, or The Ship of Fools. Eustace works in a tradition of English imaginative painters. 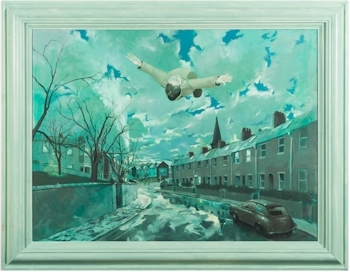 David Eustace's work has two strong themes. We are pleased to be offering a group of over 30 painting by Eustace on Tuesday, 11th April 2017. The estimates for the paintings range for £200 upwards.